Crossing the equator on a ship has long been a big deal for sailors. There are also, however, a number of other line crossings that are celebrated. 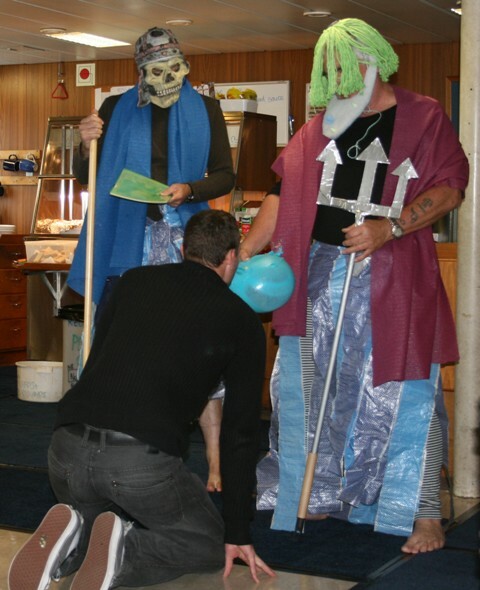 Every sailor and scientist who has not been across latitude 60°S on a ship before has to surrender to King Neptune and participate in a “Crossing the Line” initiation rite. The ceremony is officiated by the “shellbacks”, the experienced sailors that have been there before, and survived! The tradition may have originated to boost sailors’ morale on long sea voyages, or as a test for new shipmates to see if they were capable of coping with the harsh life of being at sea. In the convention of a typical hazing, it usually involves a number of unpleasant activities. Today those of us that had never crossed latitude 60°S before had to show our respect to King Neptune. After lunch we were gathered in the mess room and King Neptune appeared to announce the “Crossing the Line” initiation rite. Over the last few days the shellbacks have been telling stories about other crossing ceremonies involving crazy activities and nasty drinks. So, we were a little bit nervous about what we were going to be subjected to. In the end it was pretty tame. We were called up one by one, and had to kneel before the King of the Sea, kiss a fish, and promise him loyalty. 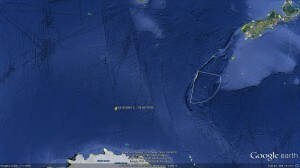 We were renamed (after different fishes), given a certificate and permitted to continue our adventure south over 60°S. 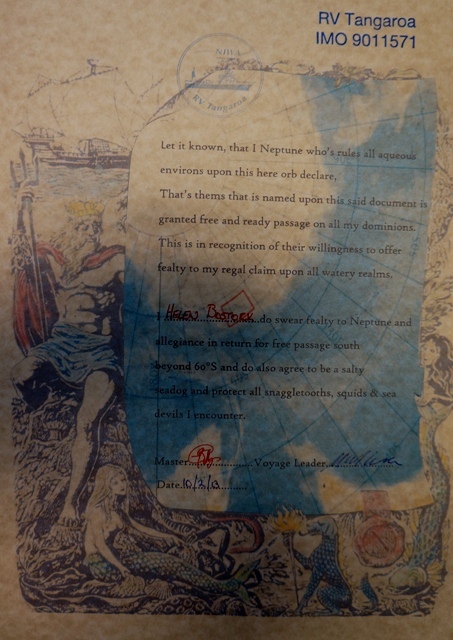 This certificate must be kept and presented on subsequent voyages – or we will have to go through it again. Unfortunately I think we must have upset King Neptune, or he is testing our resolve to continue south, as within half an hour of the ceremony the wind had picked up and we have had a rather bumpy ride…our first storm.